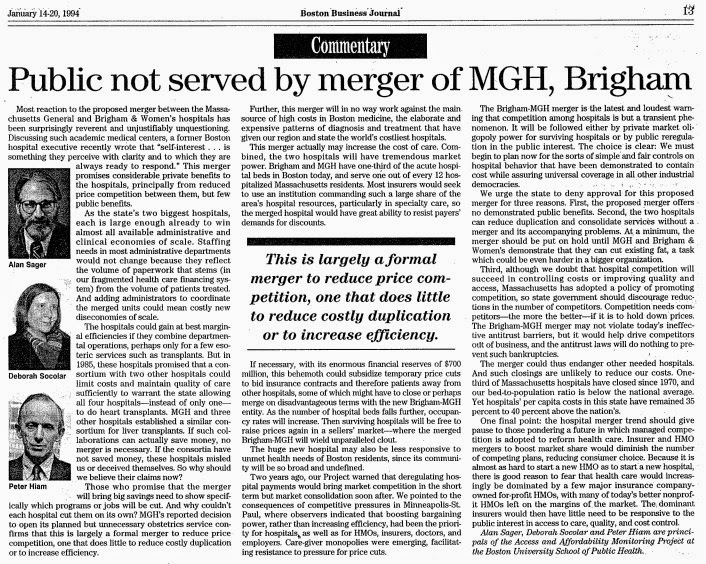 As of yesterday’s Globe, my statement in last week’s letter that there had been no editorial, op-ed or letter to the editor comments in The Globe about the AGs decision to endorse Partners’ Healthcare’s acquisition of Hallmark Health and South Shore Hospital has remained true. Just as Garrison Keillor might say,"Well, it's been a quiet week in Lake Wobegon, Minnesota, my hometown”, I could say, “Well, it’s been a quiet week at The Globe, my hometown paper.” I would have thought that all of The Globe’s editorial focus and expertise would have been brought to bear on an issue with such significant future implication for healthcare in Massachusetts. Well Gene, it goes well beyond the Globe, and the answer might be that so many people in town receive financial support from Partners that the public commentary on such issues is biased by that financial power. Let me provide two examples. HCFA seeks to create a consumer-centered health care system that provides comprehensive, affordable, accessible, culturally competent, high quality care and consumer education for everyone, especially the most vulnerable among us. We work to achieve this as leaders in public policy, advocacy, education and service to consumers in Massachusetts. HCFA publishes a blog called "A Healthy Blog" with wide-ranging commentary about health care issues in the state. I've reviewed the contents of that blog, and I have also searched for public comments by HCFA executives about the PHS market power issues. I find none. Prominent among HCFA's supporters is, you guessed it, Partners Healthcare. Is this just a coincidence? Take WBUR and its Commonhealth blog. Yes, they do cover the Partners issues and do so as fairly and comprehensively as anyone in town. 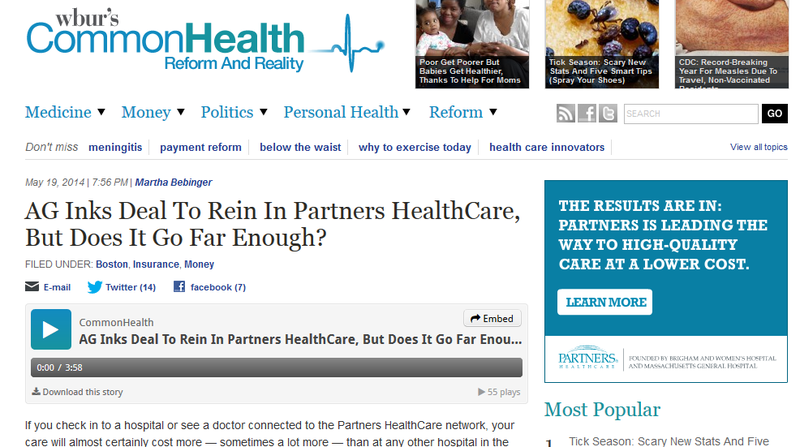 But again, prominent among WBUR's supporters is, you guessed it, Partners Healthcare. Here, the issue is not that PHS influences the editorial policy of WBUR: That clearly does not happen. In this case, the power is more subtle but no less effective: Whatever points might be made in the Commonhealth blog on this topic--read by a few thousand readers--are dramatically reduced in impact by the quid pro quo given to Partners, i.e., repeated self-serving messages on air, heard by tens of thousands of listeners during drive time. In addition, as you see above, PHS gets to place an ad on the Commonhealth site, persisting with its message day after day. Sorry Gene, the fix is in. Don't expect a level playing field when it comes to a public debate on the Partners Healthcare market power issues. What is out of reach for most patients in America is becoming a reality in one of America’s poorest and most troubled cities, Camden, New Jersey. “You get three health systems to come together who are competitors who on Monday, Wednesday and Friday want to kill each other in the marketplace, but on Tuesday and Thursday are putting together a coalition that is taking better care of patients at lower costs,” says Dr. Anthony Mazzarelli, a Senior Vice President at Cooper University Health System in Camden. Several months ago, I wrote about Edward Snowden and suggested that his failure to face prosecution was inconsistent the type of civil disobedience taught by Thoreau and Mahatma Gandhi and Martin Luther King. I received many comments on that post suggesting that my view was naïve, given the overwhelming power of the US prosecutorial system. True, it is a powerful system, but it is one that remains subject to the checks and balances that protect people under our form of government. When you fail to face the music, you undermine the moral high ground of your disobedience, and you suggest that your actions were more about you than about the cause. In the year since the first NSA disclosures, Snowdel has drifted a long way from the Thoreauvian ideal of a majority of one. He has become an international celebrity, far more championed than reviled. He has praised Russia’s and Venezuala’s devotion to human rights. His more recent disclosures have nothing to do with the constitutional rights of US citizens. Many of them deal with surveillance of foreign governments, including Germany and Brazil, but also Iran, Russia, and China. These are activities that, wise or unwise, fall well within NSA’s mandate and the normal ways of espionage. Snowden has attached himself to Wikileaks and to Assange, who has become a tool of Russian foreign policy and has no interest in reforming American democracy—his goal is to embarrass it. Assange and Snowden are not the first radical individualist to end up in thrall to strongmen. One valuable model for reform appeared last December, in “The NSA Report” of the President’s Review Group, a far-reaching set of recommendations for constraining data collection by the US government. Obama largely ignored it, perhaps counting on the waning attention of the American people. By his absence from the US—yes, even from a prison cell—Snowden tossed away his possible influence in keeping the public debate alive. It has been the likes of the “Letter from the Birmingham Jail” that have successfully pinged America’s conscience. Instead, Snowden’s choice of accepting the help of an unaccountable oligarch has forever deleted his influence back home. Snowden looked to the internet for liberation, but it turns out that there is no such thing as an entirely free individual. … No one lives outside the fact of coercion—there is always a state to protect or pursue you, whether it’s Obama’s America or Putin’s Russia. I am proud to share with you the latest work from Sepsis Alliance, where I actively serve as a member of the board. 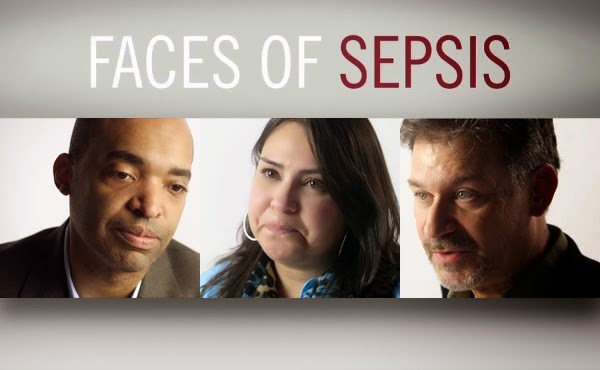 This film, Faces of Sepsis, tells the story of sepsis in a highly personal, emotional and impactful manner, and it reflects the importance and the quality of the work we are doing at Sepsis Alliance to raise awareness of this disease which is a leading cause of death in the U.S. and takes more children's lives than cancer. Please take 4 minutes to view Faces of Sepsis. Also please consider supporting our work with a donation at a level that fits with your budget and other charitable commitments. Ariana Vargas, already busy with GiveForward, has a new project for which she recently won first prize in a "white board challenge" at the MIT Enterprise Forum in Chicago. When you’re diagnosed with cancer and looking for support, My Health Sensei provides real reviews from people who have been through it before. My Health Sensei aims to be the simplest to use resource finder to help patients, caregivers and health professionals find exactly what they need as quickly as possible. Take a look, check it out, participate, and share! What do I call it when I get to co-teach an professional education course at MIT with people like this? What do the previous attendees call it? The heart of creating innovation within organizations. A new way to see innovation, much more from a social point of view instead of a technical view. A real live learning experience with colleagues from different industries, languages, and cultures. "This is what good health care costs." As I reflect back on last week's announcement by the Massachusetts AG about her deal with Partners Healthcare System, I try to draw lessons from the manner in which such issues are covered by the major media. What appears to be an impressive list of extracted concessions that a tough AG had demanded of a large and powerful system added up to nothing or perhaps were even advantageous gift-wrapping. To steal a concept from Joel Chandler Harris and the tale of “Br’er Rabbit,” Partners has been thrown into a pretty comfortable “briar patch” with this deal. In 2008, the Boston Globe published a multi-day, full-scale investigation into the degree of power achieved by Partners in the region. It stands as an excellent example of journalism and shows what happens when the major newspaper decides to put its resources into a story of regional importance. From that pinnacle, the paper now offers prosaic stories using the "on the one hand/on the other hand" approach. It included a few comments from academics pointing out flaws in the deal to balance out the positive ones offered by the AG and a health care consultant. What is striking about the coverage is the degree to which the newspaper did not draw on the knowledge and perspectives of other key players in the region, the expanded information available from state agencies like CHIA, or even on material from its own previous stories. For example, I met with an executive of a major non-PHS downtown hospital that currently gets paid 45% less than MGH for doing the same clinical procedures. That institution was recently told by a major insurer to expect a rate reduction in its contract renewal. That same insurer gave Partners a rate increase in its last renewal. If the current contingent of reporters were not well versed in health care, we could blame the shallow coverage on a lack of experience or a lack of contacts in the industry. But my view is that the local newspaper tends to reflect the community's desire for information. It is here that Partners has really won the battle. The corporation has deftly managed not only the insurance market, it has persuaded the opinion leaders in the state -- government and business -- that, to use PHS CEO Sam Thier's words to the CEO of Blue Cross Blue Shield several years ago, "This is what good health care costs." The state has become habituated to the idea that higher rates and market power are correlated with clinical expertise and advancement. That is Partners' real accomplishment and it is a doozy. With the Attorney General granting Partners Healthcare System a long-term lease on life as the dominant provider in Eastern Massachusetts, we can now focus on the likely industry structure for the region. The short version: Bad news for Tufts Medical Center and Steward Healthcare. Fair news for Lahey Clinic and BIDMC. Clear sailing for Partners. The health sector’s fast-changing economics are inflicting an increasing degree of pain at Tufts Medical Center in Boston, the latest local care provider to report declines in key patient-related categories. The results are forcing care providers, including Tufts, to rejigger their operations and squeeze costs to offset an increasingly unpredictable and in some quarters shrinking revenue pie. By all accounts it is proving a challenge to stay ahead of the trend. Let me say out loud what people have said quietly for years: If Tufts were to disappear tomorrow, its patients could be adequately served by other places in town. I'm not suggesting this is a desirable outcome, but it is a plausible one. You can only slowly decapitalize for so long before people notice a deterioration in service and morale. At Steward, the private equity owners are doing what PE folks do, i.e., extracting cash from the business and hoping to be able to sell it to "a greater fool." The problem is that no such fool has emerged yet. Indeed, potential buyers are likely biding their time, sure that the company's valuation will decline. The current or future owners will be forced to shutter some facilities. They may also seek to offer ownership of some hospitals to other parties in the region--and the then-current AG will hold his/her breath and allow Partners or one of the other systems to acquire hospitals to preserve the beds in the old industrial cities. BIDMC and Lahey missed their big chance to merge and establish somewhat of a bookend to Partners. Now, each is proceeding along its own acquisition path, with catchment areas that overlap a bit but not totally. Observers wonder, though, what kinds of promises they have made to the community hospitals they are acquiring. The underlying question is whether those hospitals will be profit centers, helping the enterprise, or cost centers, drawing capital from the mother ships. Through all this, the role of Atrius Health, as the state's largest multi-specialty practice, is key. By choosing where it will refer patients, Atrius can shift tens of millions of dollars in income between and among the tertiary hospitals. But there are signs of splintering within Atrius, and its effectiveness as a business enterprise can fall to petty jealousies and other disagreements among its constituent partners. Partners is essentially immune from all these perturbations, and the slips and slides of other market participants will just serve to enhance its market presence. Massachusetts will continue to pay above-average health care costs. The next WIHI broadcast — The Patient-Centered Medical Home: Early Results, Tough Scrutiny — will take place on Thursday, May 22, from 2 to 3 PM ET, and I hope you'll tune in. This show is a collaboration with the Journal of the American Medical Association called JAMA on WIHI: An Online Audio Forum on Quality. The Patient-Centered Medical Home (PCMH) is getting a hard look this year. In a study published in JAMA in February, the largest of its kind, researchers followed 32 primary care practices certified as PCMHs over a three-year period, and were unable to find any impact on overall health care costs or patients’ utilization of health care services, including emergency departments. To put it mildly, this was not welcomed news by the health care improvement community — especially those who are looking to PCMHs as one jewel in the crown of a redesigned primary care system that offers patients more integrated, coordinated, cost-effective care. Headlines such as “Medical Homes Haven’t Saved Money or Substantially Improved Care” and “Medical Homes May Not Be The Answer” suggested just the opposite. This is not the entire story. The state of Minnesota recently issued a report on its success with PCMHs. And, where focused work is underway elsewhere, the uptake of process improvements is encouraging. But the study in JAMA has functioned as a sort of wake-up call, which many experts, including champions of PCMHs, believe is timely and beneficial. Dr. Goldman has offered some perspective on the study in a blog post and in a short video in anticipation of the WIHI broadcast where we'll look at the research, the strengths and weaknesses of the study design, and what lessons can be gleaned for transforming primary care going forward. Please join us for the May 22 WIHI: The Patient-Centered Medical Home: Early Results, Tough Scrutiny, produced in collaboration with JAMA. WIHI Host Madge Kaplan and co-host Dr. Goldmann, IHI’s Chief Medical and Scientific Officer, have put together a panel to walk us through the issues, starting with the lead author of the JAMA study on PCMHs in Southeastern Pennsylvania, Dr. Mark Friedberg. 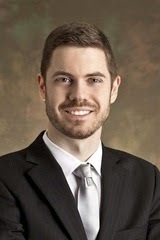 He’ll explain how the study was conducted, its key findings, and its recommendations. Dr. Richard Barron will bring the perspective of ABIM to this discussion, plus his long experience improving outpatient care. This includes his leadership of a physician practice in Philadelphia that was one of the first in the country to successfully adopt electronic health records and achieve Level 3 PCMH recognition from the National Committee for Quality Assurance or NCQA. Dr. Christine Sinsky has a broad view of the issues, too, and is also deeply engaged in day-to-day clinical practice in Iowa. She contends that gaining PCMH certification is just one part of a multi-dimensional effort to transform practices to provide high-quality, cost-effective care; it is not an end in itself. All the guests, along with Madge Kaplan and Don Goldmann, very much want to know your successes and challenges with PCMHs and what sort of measures and evaluations of this work are needed going forward. Bring your teams and your energy to the May 22 WIHI! I was always told that it is really important for reporters to have a good sense of the biases and credibility of their sources. After all, those sources are used to fill in stories by offering a perspective not always possible from the protagonists in the story. So, it was with some surprise that I saw this quote in a local story about the MA AG-Partners Healthcare deal from a person who makes money by selling consulting services to hospitals. That the newspaper could include this quote with no indication of the consultant's client list seemed wrong to me. I inquired about this matter on a listserv maintained by the Association of Health Care Journalists, asking: "Do you agree or disagree with me that quoting the healthcare consultant in this story without indicating his client list is a violation of good journalistic standards?" You are asking a very good but tough question. There are a couple of factors that might cause a reporter not to ask about a consultant’s affiliations. First, I have never asked for a consultant’s client list and your message made me rethink how I will approach consultants in the future. Not sure any consultant would reveal that he or she consults with the hospital in question but maybe and it’s certainly worth asking. Two, under the pressure of deadline I find myself looking for sources to comment and sometimes I’m just happy to find anyone who knows something about the issue. Sometimes the details of a deal are so arcane that it’s very difficult to find anyone who is knowledgeable enough to comment. That’s not an excuse. It’s just that there’s ideal journalism and then there’s the reality of getting the article done in time to get it off to the editor. Although I haven’t worked in a newsroom for many years, the pressure to get stories completed early can be intense. And sometimes when rushing, important details get left out or edited out when they should be in. The answer to your question is: Yes, I agree that quoting the consultant without indicating his client affiliation is a violation of good journalistic standards. By leaving out that information, the writer is misleading the reader whether intentionally or not. I think there is a good lesson here: It should be standard practice to ask a source if he or she has or has had any financial relationship with the protagonists in a story or, indeed, the competitors of the protagonists. That information should then be included in the story so a reader can make his or her own judgment as to credibility. Perhaps the source would not disclose, but in that case the reporter should move on to another source. It is clear that this person is a handy source for the reporter to call when he wants comments on this side of the issue. But readers have a right to expect that the newspaper will do due diligence on the financial relationships that the source might have and disclose those findings to its readers. White House Chief of Staff Denis McDonough says President Obama is very upset about reported cover-ups at veterans' hospitals and long waits for treatment at VA facilities that have drawn widespread scrutiny. "The president is madder than hell. I've got the scars to prove it," McDonough said in an interview with CBS News's "Face The Nation" that was broadcast Sunday. "Nobody's madder than me that the website isn't working as it should." "It's inexcusable, and Americans are right to be angry about it, and I am angry about it," he said. The President continues to confuse his role as chief executive with his previous role as US Senator. As a legislator, you have the freedom to cast aspersions on the executive branch. As CEO, in contrast, you own the executive branch. Your job in this kind of situation is to apologize sincerely to those affected and the public as a whole; calmly acknowledge that bad decisions were made; offer appropriate short-term remediation to those affected; to convene--with a review panel of respected people from both parties--a plausible root-cause analysis as to what went wrong and why; and to announce the changes that will result. There is an analogy here to the medical world, when an error is made that hurts a patient: Disclose, apologize, compensate, determine the root-cause, implement solutions for the future. Some might ague that the body politic is too virulent to allow this kind of reasoned approach. My response is that the opposition will always make a fuss anyway, and there is no point in feeding into their portrayal of anger by adding your own. It just makes you look powerless. While you may not be the one tweeting or designing infographics for your organization, you may be hiring and supervising the people who do as well as planning health campaigns that use digital technologies. Instead of struggling through or worrying that you are using the wrong terminology or dated technologies, be a leader by enrolling in the certificate program in Digital Health Communication offered through the Health Communication program at Tufts University School of Medicine. The certificate program includes five graduate level courses: a 1-week course at Tufts' Boston campus, Digital Strategies for Health Communication, and 4 online courses, offered evenings using Webex, that include Social Media and Health and Mobile Health Design. The certificate can be completed in 1 year. Learn more here or contact Lisa at lisa.gualtieri [at] tufts [dot] edu for more information or to sample a class. I was surfing through LinkedIn and came across a person with the following position: Vice President, Physician Alignment. My first thought was how generous it was for this hospital system/ACO to offer chiropractic services for its doctors! But then I realized that the job of this person was different. It is something about ensuring that physicians behave in such a manner as to optimize the bottom line of the ACO. There's a whole gaggle of business consultants in this arena, complete with graphic presentations that are portrayed as meaning something. Reporting to the Vice President of Physician Alignment and System of Care, directs the operations and programs of the PHO including but not limited to its risk-based and Clinical Integration programs. Administers all aspects of the PHO’s capitated risk and Clinical Integration contracts, in a manner to ensure contractual obligations are met and optimal financial, clinical, and stakeholder satisfaction results are achieved. Collaborates with ACO leadership, physicians, ancillary departments, affiliates, and community-based health care providers to develop and provide effective integrated-care delivery for ACO’s covered populations. I remain a skeptic about all this stuff. It all seems driven by the money, the bottom line. 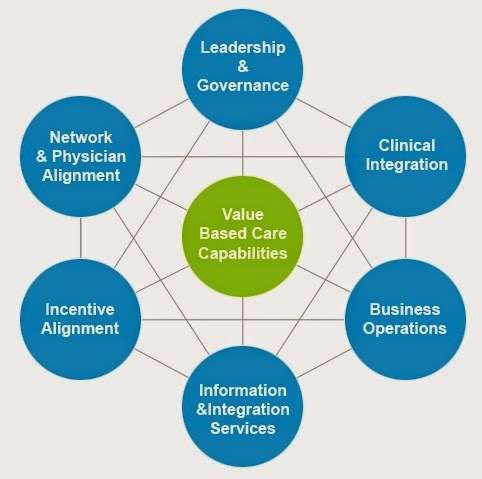 Sure, there are always a few words about "integrated care delivery." But I don't believe that it is motivational to most doctors to be told that they must "align." Following up on the piece referred to below written by Doug Hanto about preventable harm, please see this lovely article in a new magazine called Pediatrics Nationwide, published by Nationwide Children's Hospital in Columbus, Ohio. In October 2008, Richard Brilli, MD, stood in a silent conference room, waiting for his audience to digest the news he’d just delivered: hundreds of significant harm events are identified each year at Nationwide Children’s Hospital, and nearly every one of them could be prevented. The group before him, the institution’s board of directors, knew that incidents of preventable patient harm are an unfortunate reality in the health care industry. But hearing the numbers aloud made the reality all the more real. As the chief medical officer at Nationwide Children’s, Dr. Brilli felt strongly that the problem couldn’t be addressed on a national scale until individual institutions tackled the problems from within. So in 2008, he found himself convincing the board of directors that just reducing the number of serious harm events wasn’t enough. The goal, he argued, had to be eliminating them altogether. [N]early 9,000 employees underwent comprehensive safety training. In 2011, Nationwide Children’s became the first pediatric institution in the country to make its serious safety event statistics public. “Health care outcomes are only going to improve if everyone is willing to change long-standing habits and do that consistently, and being transparent is an important part of that,” Dr. Brilli says. Two articles crossed my "desk" today that provide useful bookends to the issue of physician responsibility and engagement in patient safety and quality of care. The first, by Brad Flansbaum at The Hospital Leader, cites an article from the New England Journal of Medicine summarizing the relative lack of effectiveness of pay-for-performance metrics in the National Health Service. Economists and some public policy folks like to think that, "if you get the pricing right," all good will result. Well, first of all, getting it "right" is not as easy as it sounds. Secondly, attempts to use such metrics with many physicians are ineffective at best and counterproductive at worst. There are substantial problems with linking patient-experience scores directly to physicians’ pay and this unpopular indicator [access to care] was dropped in 2011. There is some evidence that, as in a previous incentive program in the United Kingdom, the Quality and Outcomes Framework has led to some adverse effects on the quality of care for medical conditions that are not included in the incentive program. As the percentage of physicians’ pay that is tied to performance increases (e.g., above 10%), the effect of the program is likely to increase, but so are the risks of unexpected or perverse consequences. Our personal responsibility and commitment to the highest quality and safest possible patient care are the foundation of all that we do as surgeons and are reﬂected in the phrase primum non nocere. Consequently, we should all be change agents for eliminating preventable harm. Patient safety should be our primary core value even if we are not patient safety experts. Although surgical care involves complex systems, it usually begins more simply with the interaction between 1 surgeon and 1 patient. This is where we should redouble our efforts to believe in and, even more importantly, to do patient safety. What are our personal responsibilities and how can they contribute to making our patients safer? First, surgeons have an obligation in their surgical education and training to achieve competency in patient care, medical knowledge, interpersonal and communication skills, professionalism, practice-based learning and improvement, and systems-based practice. Second, as part of our training, we all have a responsibility learn the terminology, science, and practice of the ﬁeld of patient safety, to internalize and apply its principles daily in our own clinical practice, and, at least for some of us, to receive additional training so that we are able to teach patient safety to others. Third, with the rapid changes in evidence-based medical practice, we have a responsibility as lifelong learners to continually update our surgical knowledge and skills through personal study, courses, and training, as required, and to implement evidence-based and other appropriate changes in our practices. Fourth, we must continuously evaluate the quality of care we are delivering to our patients. This requires the collection and analysis of data based on meaningful metrics. Fifth, recognizing that patient safety is a team sport, surgeons need to lead by challenging the authority gradient, asking for discordant opinions, and welcoming team members who speak up and challenge him or her. We should lead the efforts of our hospital and practice quality and safety experts by actively participating in and promoting initiatives such as hand hygiene, central line infection prophylaxis, universal protocol, and so on. We need to model the relevance and importance of these efforts on our patients, students, trainees, and other health care providers. More surgeons must become trained leaders in these efforts. Recognizing that ﬂawed systems are at the root of much preventable harm, we should take personal responsibility for, support, and even lead efforts to implement improved systems that prevent patient harm. If our institution is lagging behind, we should be at the forefront of forcing change. What's striking about the Mass. AG's deal with Partners Healthcare System is what it does not do. Although it puts some restrictions on the organization, it leaves in place a colossus with a common bottom line that can shift costs among its component parts. And, the actual restrictions will not make any appreciable difference in the pricing differential for this system relative to others. The CMA has found that many private hospitals face little competition in local areas across the UK and that there are high barriers to entry. This leads to higher prices for self-pay patients in many local areas – and for both self-pay and insured patients in central London, where HCA, which owns over half of the available overnight bed capacity, charges significantly higher prices to insured patients than its closest competitor. The CMA will also require HCA to sell the London Bridge and Princess Grace hospitals or alternatively the Wellington hospital including the Wellington Hospital Platinum Medical Centre (PMC). Why did the AG blink at this possible remedy? It's time to break up Standard Oil. Of course, back then, the Supreme Court did the job. Here, clearly the AG made a deal with the US Department of Justice to obtain primary jurisdiction for the case. The problem with that is that the AG just has too many local affiliations to effectively regulate this massive employer. There's a reason we need Federal oversight from time to time. The DOJ erred in allowing otherwise in this matter. What will happen in markets like Boston where there is a dominant health care provider with dramatically higher costs than the rest of the market? Is it possible for insurance companies to create commercially viable limited networks comprising the lower costs doctors and hospitals? They may try, but the day may also come when that provider group, to save its position, will create the insurance entity that will focus business towards itself. Once it does, it will be able to manipulate internal transfer pricing to optimize profitability. 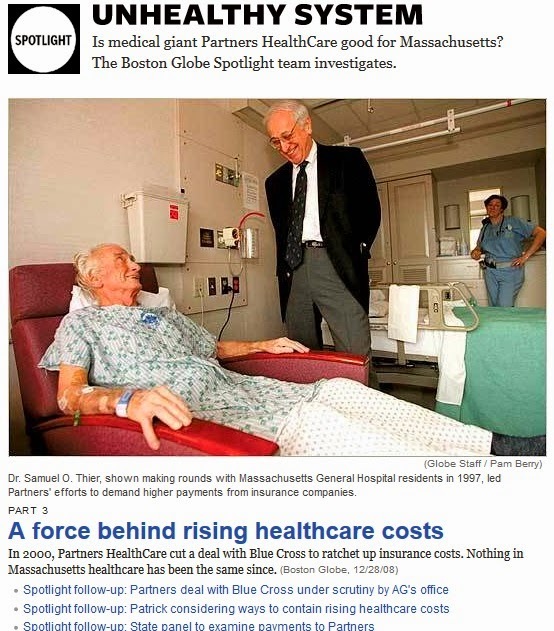 In January 1994, Alan Sagar, Deborah Socolar, and Peter Hiam published an opinion piece in the Boston Business Journal advising against state authorization for the merger between MGH and Brigham and Women's, and the other community hospitals, and the physician organizations that ultimately became the Partners healthcare System. Their summary is evident from the out-take you see above: This is largely a formal merger to reduce price competition, one that does little to reduce costly duplication or to increase efficiency. Notwithstanding their cogent arguments, then-Attorney General Scott Harshbarger, approved the deal two months later. Charles Baker, [Governor] Weld's secretary of Health and Human Services, came to regret signing off on the merger when he later became CEO of Harvard Pilgrim Health Care and sat across the bargaining table from Partners. He has compared it to "having the grenade that you throw on one end of the boat roll back down and blow up on you when the boat shifts." Now, the current attorney general has entered into an agreement with Partners, with the following headline: Comprehensive Agreement will Fundamentally Alter Partners’ Negotiating Power for 10 Years; Cap Prices, Physician Growth, and Hospital Expansion for Entire Partners Network. There is no mention of a return of excess profits obtained since PHS was created, which made possible the growth of an excessive balance sheet, plus the expansion of physical facilities, plus the acquisition of the current physician network. Today the company says it controls 22 percent of the eastern Massachusetts inpatient market. But the percentage of patients living in the four counties nearest Boston who were discharged from a Partners-affiliated hospital rose from 19 percent to 37 percent from 1996 to 2006, according to the Massachusetts Health Data Consortium. The pricing power and excess revenues have all been documented in the AG's own reports for several years. As well as a CHIA recent report. The amounts involved are in the billions. Yes, billions, not hundred of millions. This has been a pervasive tax on the Massachusetts economy. Of course that assumes insurers in Massachusetts would offer lower cost hospitals rate increases that are almost twice as high as Partners, something they have never done before. In short, Partners gets to keep the money already extracted from the public, while collecting future excess revenues. What a reward for years of monopoly-like behavior. The AG met them over the bargaining table and blinked rather than pursuing a full course of remediation. It's great to issue thorough reports, but not if they don't properly inform the development of legal standards or public policy. I’m writing to you about a fundraiser I have been working on these past few months with my fraternity, AEPi, for Save A Child’s Heart. Our campaign has been a major success and it’s been a really amazing experience working on this fundraiser during my spare time. In case you haven’t seen yet, here’s a video we made of students getting pied. Save a Child's Heart is an organization that identifies children from developing countries with potentially fatal but treatable heart conditions, flies them to Israel, and provides life-saving heart surgeries. The Israeli doctors who perform the surgeries are all volunteers, but the total cost amounts to $10,000 per child. As the fundraiser has grown more and more successful, our chapter alumni have agreed to match 5K for 5K, then 10K for 10K, then 12.5K for 12.5K. Now, if we reach $15,000, our alumni will match our donation, bringing the total to $30,000. This is enough to save the lives of three children. We're only $1,500 away from saving the lives of three children, and we need your help. If you think this is a good cause, please consider making a donation! If this newspaper story by Robert Weisman at the Boston Globe is correct, the Attorney General is about to sign an agreement with Partners Healthcare System that will lock in the system's dominance for years to come. Under the deal, which has yet to be formally signed, Partners’ prices would be tied to the rate of inflation, currently about 1 to 1.5 percent. That is significantly less than the recent trend of health care cost increases. Here's why. We are talking about a system that has used its market power to build up its rates levels to be substantially above the rest of the market, say 15%. Then our remedy is to limit its increase to inflation? Big deal. All other hospital systems are also limited in their rate increases by recent state legislation. Sure, they might get to go up a bit faster than Partners, but if you look at the starting point, it will be decades--if ever--before PHS rates are equivalent to the rest of the market. Boston University professor of health policy Alan Sager called the settlement a “functional compromise” by Coakley, who is a Democratic candidate for governor. The bill would allow health spending to grow no faster than the state economy overall through 2017. For the five years after that, spending would slow further, to half a percentage point below the growth of the state’s economy, although leaders would have the power under certain circumstances to soften that target. You also need to understand that virtually every hospital system in the country has set an internal rate growth target equal to the expected rate of inflation. Partners is giving up nothing by codifying that. By the way, here's the the comment in the Globe story given by a person who makes money by selling consulting services to hospitals. How the newspaper could include this with no indication of his client list is beyond me. 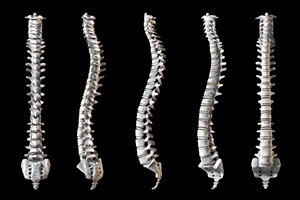 We have to admit that none of the Democratic candidates for Governor (including one I have supported) has shown any spine with regard to taking on this behemoth. Not one. But this is the first of the candidates who seems to be explicit about selling out. Let's see if any of the others are willing to take on the issue. There continue to be lots of stories about the high cost of the new drugs to combat hepatatis C. Here's one from NPR by Melissa Block and Richard Knox. In a previous post, I talked about the presence of a distinguished academic on the board of Gilead, the company that makes one of these drugs. It's time to ask the question more directly: Where does Dr. Richard Whitley stand on this matter? What does his silence on this issue say to the country about his duty to two masters, a federally subsidized drug research effort and a pharmaceutical company? What message does that send to the public about how they should view the relationships between academic medical centers and industry? We don't need a Sunshine Law to see that Scott Gottlieb has it right: The profession, and academic medicine especially, is failing in its responsibility to act as the steward of the occupation’s standards. The “Physician Sunshine Act” is as much a response to the past marketing excesses of the drug and device makers as a reflection of the retreating stature of the American doctor. Aspects of medical practice that were once firmly the domain of professional bodies are now subject to federal tinkering. This has profound implications for doctors and patients alike who have firmly ceded vital autonomy. The Sunshine Act mandates that medical product companies report to the Federal government any payment or “items of value” that total $10 or more and are provided to an individual physician over the course of one year. The law also applies to “indirect transfers.” For example, when a drug company pays money to a marketing firm and then expects the group to provide something of value to doctors. [P]rofessional medical societies should ponder how the rise of these kinds of state and federal laws represents a failing of their responsibility to act as stewards of the occupation’s standards. This sort of federal regulation represents an enduring change in how Washington views the entire profession. Other professions (journalism, financial services) impose rules and limits on consulting work and outside payments. But perhaps no other profession is subject to federal limits and reporting requirements that are as profound as those now imposed on physicians. One of the central tenets of professional autonomy and responsibility is the act of self-regulation. . . . Now the only professional currency that counts is what gets codified into federal regulation. Is this part of the promised lower costs? Insurance companies, like drug and medical device makers, were required to help fund the Affordable Care Act through annual taxes that must be booked in the first quarter for accounting purposes. But the insurers said they will try to recoup much of the added cost through the year by boosting premiums for employers and individuals buying insurance. The taxes and fees tied to implementation of the Affordable Care Act were assessed for the first time in the most recent quarter. They will increase in each of the next four years before leveling off in 2018. Nationally, the cost to insurers has been estimated at $8 billion this year. Access, lower cost, and choice. Right. I used to think it was two out of three. Now, it appears to be only one out of the three. For those interested in the future of journalism in the digital age, there is likely to be no more significant document than a recent report prepared for the New York Times. Here's a great summary from the Nieman Journalism Lab. The successful integration of new technologies is essential to continual success in today's fast-moving global economy, enabling businesses to upgrade their systems to be more effective, reliable, and scalable. Because this requires a critical alignment of business processes and technologies, organizations invest heavily in system implementation projects. Nevertheless, these projects often encounter unanticipated roadblocks to success. outline steps to take to enhance strategies for addressing complex technology implementation dynamics. 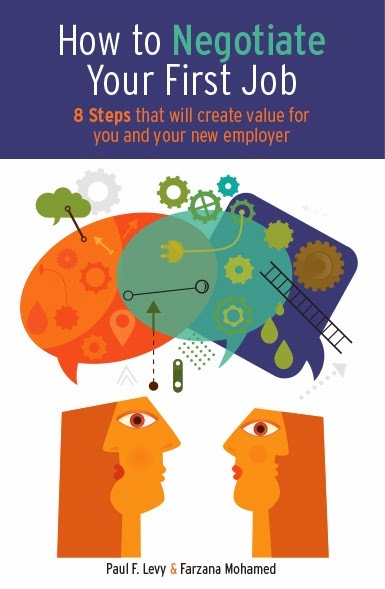 Thanks to Glassdoor for inviting us to post this article. 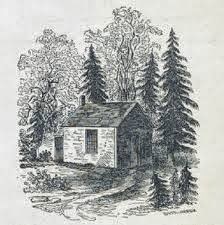 Thoreau says "Keep Walden Free"
Well, no, he doesn't say that, but he would if he were around again. The state DCR is considering proposals that would prohibit swimmers from swimming across Walden Pond (open water swimming, or OWS). This is raising the hackles of lots of people, from triathletes to us normal swimmers, who enjoy wide open water where we can swim for a mile or more--and who value Walden for recreation and spirituality. The DCR was soliciting user community input on what to do with the question of OWS at Walden. The concerns of DCR are multiple and sometimes conflicting. From the perspective of DCR, the current state of OWS at Walden is "unsustainable". Their concerns range from liability to their inability to patrol such a large body of water. Five to seven times per year they need to rescue swimmers outside the boundaries. Their life=guarding resources are not adequate to that task. They do not view triathletes as the problem, they seem to be more concerned with the untrained individuals who copy the triathletes and get in "over their head". DCR, from an organizational perspective, is asking itself the question "Why does this park have special swim privileges found at no other DCR park?" 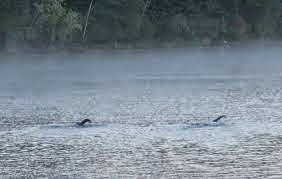 (Yet DCR loses more swimmers in shallow, guarded areas of its parks than anywhere else). DCR has a real concern with having a set of rules (swim only in designated areas) yet also having a policy to ignore their own rules. DCR feels that 2014 needs to be a "year of transition" to a more rule-driven, controlled OWS environment. DCR also stated "it does not want to do anything stupid". DCR started the meeting by presenting two beautiful 2' by 3' color maps of Walden's 2014 designated swim areas. The designated OWS area was a 125 yard lane parallel to Red Cross beach. That's it. The other 99% of the pond was off limits. They solicited group input on these maps, which was universally hostile. DCR listened to us and withdrew this proposal fairly quickly. Other proposals were knocked about, perhaps a swim testing program to qualify to swim open water, better education about the risks, limited hours for OWS ... nothing was really hit upon as the solution. In sum, no resolution was reached. DCR really made an effort to listen to the concerns of the user communities, but as I state above, they have their own significant concerns as well. They are going to digest what they heard tonight and regroup. With Memorial Day weekend around the corner, where precisely does this leave us? I believe we will be permitted to continue to OWS, but changes are likely to be made. We must positively and firmly engage with DCR to meet their concerns, yet protect our interests. I wanted to send along a quick note to again express our sincere appreciation for your contributions to last night's meeting. Our hope going into the evening was to emerge with a better understanding of the inspirations, use patterns, and concerns of the open water community and through that to identify opportunities to minimize conflicts with our regulations and policies and maximize safety for open water swimmers, the general public, our staff and other rescue personnel. We could not be more pleased with the outcome in that regard. By design or luck our group reflected the diversity of the open water community relative to time of day, style of swimmer, and the motivations that bring you to the water's edge and beyond. Among all those differences, there was universal agreement on the importance of Walden Pond in your lives and your vigorous opposition to any plan that constrained your swim to a lane along Red Cross Beach. We at DCR gained immensely from the conversation and we look forward to an ongoing dialogue as we explore ideas you shared and your genuine willingness to adjust some preferred patterns in order to accomodate the agency's public safety and management goals. First, on enforceability: Any rule that inhibits OWS will be disobeyed (yes, just like H. David Thoreau would advocate as a form of civil disobedience!) Enforcement, given DCR's limited resources, would have to occur by issuing violation notices by park rangers when people return from their swim. If any of those people contested the fine, DCR would have to send its staff to court to document the event and advocate for the penalty, drawing resources away from the lake. Second, on the issue. Why now? OWS has existed at the lake for decades. What is prompting this proposed change that didn't exist years ago? (I guess there were some similar thoughts in 2010.) Those engaged in OWS are adults who understand the risks. If the issue is the budget impact of the very occasional rescues, simply put in place the kind of rule that exists in the mountains in some jurisdictions: If you need to be rescued, you pay for it. Friday, May 16, at 5:00pm: Breaking news from Universal Hub! Over the last three years, there have been 28 saves by lifeguards at DCR's Walden Pond, 13 of these saves came from outside of the designated swimming areas. Water rescues in depths of more than 20 feet put swimmers, lifeguards, and emergency response personnel at a greater risk. In recent years there has been a marked increase in the number of inexperienced swimmers attempting to cross the pond creating a new and more urgent public safety challenge for the agency. 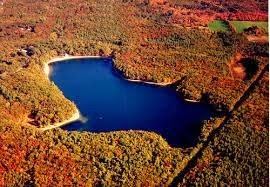 Walden Pond is a kettle pond that has a depth greater than 100 feet (108’) at its deepest point. In an effort to ensure the public’s safety at Walden Pond, while attempting to accommodate the growing popularity of long-distance swimming, DCR recently shared a draft proposal with The Walden Pond Advisory Board and other community stakeholders that would create an unobstructed, 125 yard swim lane for distance swimming in a designated unguarded swimming area. This proposal has been met with some skepticism by community advocates. As a result of ongoing conversations with advocates and emergency responders, this proposal is no longer being considered. I don't understand this, do you? 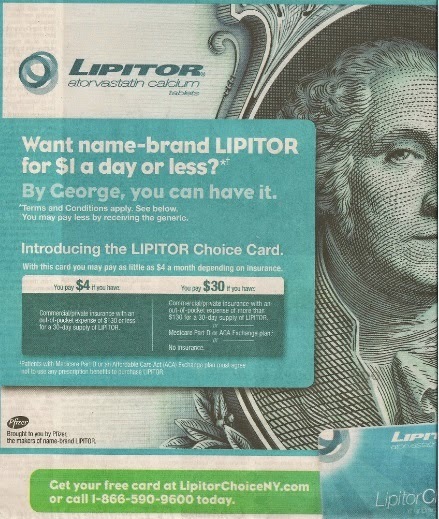 Here's a full page ad from Pfizer in the New York Times that, it seems to me, makes a prima facie case that the company is engaged in price discrimination against (1) the federal government through Medicare and ACA Exchange plans and (2) uninsured people. If you are in those categories, you pay $30. On the other hand, if you are with a commercial insurance company with one kind of policy you pay $4, and with another kind of policy, $30. I guess this is legal, but it sure makes you wonder how it can be, or whether it should be. Thanks for the donation, doc? I guess we would call this a success, but it doesn't feel like it to me. Indeed, it feels like someone is taking advantage of the good will of doctors. Maybe this is the thing I didn't communicate effectively: all of the free surgery programs I'm talking about here were started by surgeons as their own volunteer enterprises. They then got the hospitals on board to donate facilities, materials, and liability coverage, and I wanted to explain one of the hospitals' motivations for doing so. I didn't include a skeptical doc because I simply didn't encounter one -- it was their idea to donate their own time on Sundays. That is lovely, for sure, but in my mind it still remains wrong that this should be necessary as a solution to this problem created by state governments.